Here in part three I'll be showing you how I pieced together my quilt top, sharing 5 tips, and the finished quilt. As a quick review, this quilt pattern can be purchased in Cricut's Design Space and the fabric kit can be purchased on shop.cricut.com. 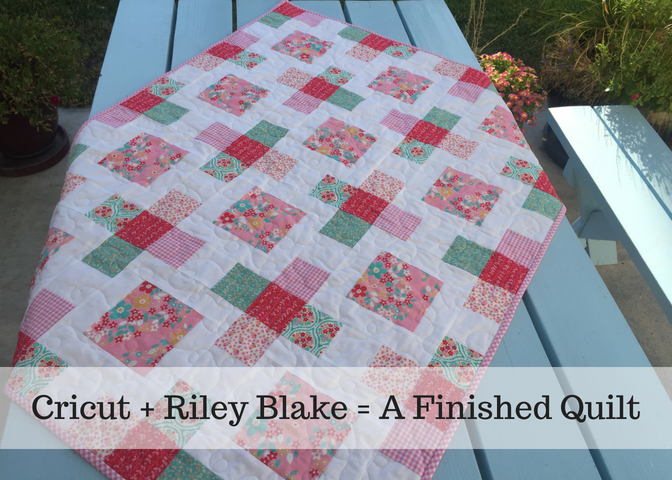 Also, all the Riley Blake fabric kits can be found here. 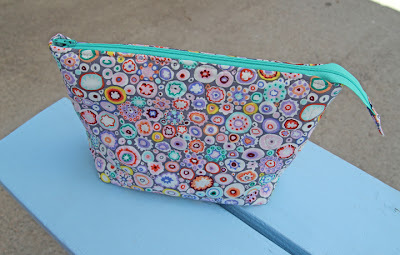 You can read about how I chose my pattern and fabric in part one of this three part series. I started with all the quilt pieces already cut out and ready to go. All the pieces were cut using the Cricut Maker and the Rotary Blade. See my cutting process in part two of this three part series. Ok, let's get started! The first thing I did was to read through all the instructions to get an overview of the process and I kept the computer right by my machine so I could refer to it easily. Tip #1 - Chain stitch and group like tasks together. Chain stitching is simply continuing to add the next piece to be stitched to what you are already sewing. With quilting, you can save a lot of time by doing this and other like tasks in groups. Chain stitch as much as possible, then cut everything apart, then move to the iron. Tip #2 - Pull and press. I like to iron on the wrong side of my fabric first. I create tension by pulling with my hand on one end and pressing with the iron on the other, pressing the seam to one side. I then flip the block over and press the right side. Tip #3 - Use labels. After making all the quilt blocks, I lay out my quilt according to the pattern and stack everything up in rows. I always use a label to indicate the top left of my quilt. As I'm sewing together a row of blocks, I label the top left of each row. This helps me keep track of the direction of each row. Tip #4 - Nest, pin, sew. For perfectly matched up seams, nest them together and pin. I pin every single seam. I either sew over the pins (slowly) or I remove the pin after I've sewn over the seam. I pin at an angle to make this possible. I'm using Cricut's Sewing Kit which has everything I need! Also, I'm using my Singer Featherweight 221 for this quilt top (more about this vintage machine to come in a future post). Tip #5 - Trim threads as you go. If you leave long thread tails everywhere they will get caught up in your seams and you will have to trim them anyway, so just do it as you go. and bind it (more about how I quilt and bind my quilts in a future post). I was so glad to be able to let my Cricut Maker do all the cutting for me so I could get to the fun part of quilting faster. The sewing is what I really love. The hum of my little Featherweight, the excitement of seeing the final project come together, and the binding...oh how I love gingham bias binding!! !